Rosemary Lamb Skewers are absolutely bursting with Mediterranean flavors., and they’re quick, easy and over-the-top delicious! Lamb and rosemary recipes are always a hit! I get all sorts of cooking requests from my boys. Sometimes it’s as boring (no offense! ), as buttered toast or cheese and crackers — but, other times it’s quite interesting. My younger son once helped me create a recipe he’d concocted in his mind for Bacon-Waffle Deviled Eggs. And THE Breakfast Taco was my older son’s idea. So last week my older son came home from school one day and announced he told his history class that his Chef mom would make a bunch of food to represent Ancient Greece . . . .
What are food of Ancient Greece, you ask? So when I set out to create a dish that would go with the Ancient Greek them, to be honest, it was mostly about what I thought the kids would like, and what I knew to be Greek flavors. So yes, not very authentic. The food of Ancient Greece was actually characterized by their frugality, reflecting their agricultural hardship. The Ancient Greeks mostly consumed wheat, barley, olives, olive oil and a whole lot of wine. I remembered my friend Judy’s amazing lamb we had at our Summertime Garden Party. It combined lamb, rosemary and garlic. Lamb and rosemary recipes are always delicious, so this was my starting point. 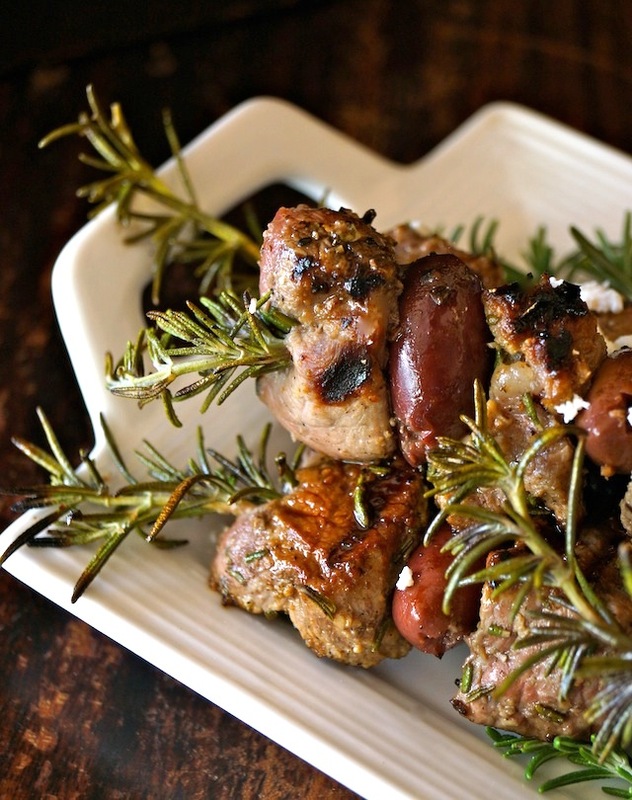 Apparently, these Rosemary Lamb Skewers were a huge hit in class — and at home! I always love having new, super tasty recipes for grilling. Hopefully you do too. These Rosemary Lamb Skewers are absolutely bursting with flavor. They're quick, easy and over-the-top delicious! Rinse and dry the rosemary. Then remove all but the top 1-inch or so of leaves from each sprig. Finely chop about half of the removed leaves -- you need 2 teaspoons of it. Set the 8 cleaned sprigs, and 2 teaspoons of finely chopped rosemary aside. Add the olive oil, garlic and 2 teaspoons of finely chopped rosemary to a medium-sized mixing bowl. Add the pieces of lamb and mix to coat it well with everything. Now begin adding the lamb and olives to the cleaned rosemary sprigs. Add 4 pieces of lamb, alternating with 4 olives on each one. Preheat a stove-top or outdoor grill and season both sides of the kebabs with salt and pepper. Arrange the kebabs on a platter, or individual serving plates, and sprinkle them with the Feta while they're still hot. These look amazing and I love the addition of olive and feta. Wow !! Amazing Kebabs recipe. Thanks Valentina for sharing this recipe. And it’s a less time consuming recipe. I will definitely prepare for my kids. Keep posting ? Thanks so much! Yes, it’s a fairly quick recipe to prepare and both my kids really enjoyed it! Yay! I’m salivating for these. Love the fact that this was your son’s idea! My father loves lamb, but since mum is not very keen on it (and she’s in charge of cooking, as it happens), he rarely gets to enjoy it.That’s definitely something he would be crazy about. Flavourful, meaty, perfect! I love the sound of these! We eat a lot of lamb in this house and there’s always kalamata olives and feta in the fridge. I must make these for our next BBQ! Thanks so much, Elizabeth! Hope you try and love them! I love the addition of the olives! That was one of those, “why didn’t I think of that?” moments! Have a great weekend!